I Love this sitting area in the dining room – lots of light & big windows! When trying to decide what to do about the window coverings, I decided to leave them open. At the end of the season, I went outside & gathered some vines from the cottage garden. Then, I simply took some small gage wire & hung the garland up on some small nails that were placed every few feet near the ceiling. You can see the little white birds that I added. They clip on & add a nice natural feel. During the Christmas season, I hang our Christmas cards along the garland using an opened paperclip place in a hole in the corner of each card. 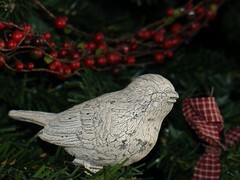 Here’s a picture of one of the birds close up, although this one is on the primitive Christmas tree on the side of the room. It’s so easy to add a natural feel to a room. Here, I’ve used a harvest basket, plants, vintage watering can, clay pots, birds, and a cast iron bunny. Black wrought Iron Curtain Rods – Cheap! I just recently made (with some help) curtains for my living room and kitchen. In the kitchen we made a curtain that rolls up under a small panel and two peices of fabric come from behind the curtain over the roll and velcro under the panel. That way I have privacy at night, then during the day I can roll it up for light. The panel and tabs are one fabric and the curtain is another. This might look nice in your room with a real nice cottage fabric. It really is a cute curtain, if you are interested I can send pictures. Very, very pretty and inspiring! I know I will be on the look out for these type of branches on my daily drives…thank you for the inspiration! 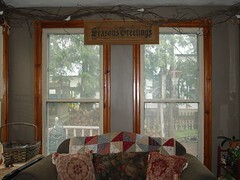 Lovely idea.Thanks for sharing.I love birds and grapevine and this is so great to decorate with the seasons.